I’m changing to past tense in all future blogs about the Golden Oldie Travels of 2013. After all, I am now home from my adventures and trailing in my writing by a year, oh dear, sorry folks but I was having way too much fun and the writing took second place, but……. 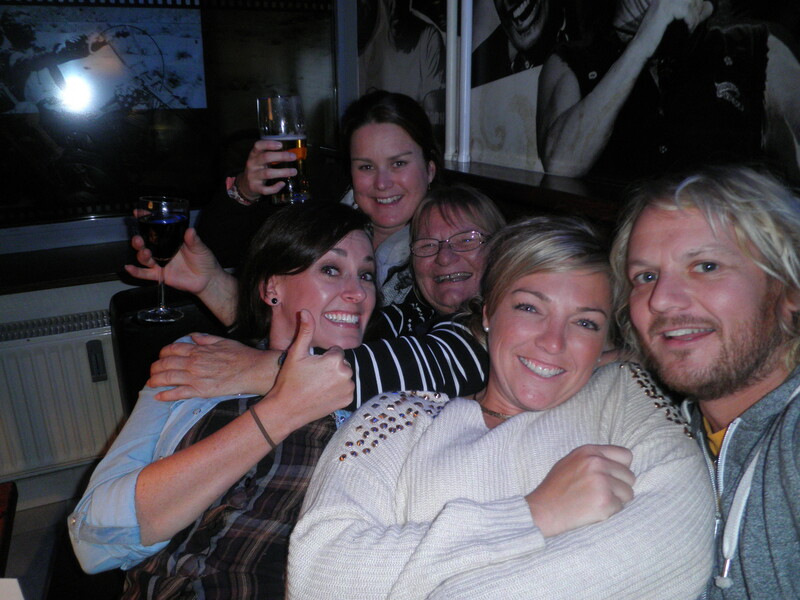 I am loving reliving my travels through the blogs and I do hope you are enjoying them with me. Our day to leave Belgrade dawned, the online timetable said that there was a 5.30 am train to Zagreb so I suggested we catch that one instead of the 10.30 train as there was only a half hour connection window between the Belgrade train arriving in Zagreb and the Ljubljana one leaving. So after a night of no sleep (Ginski I could understand as he got up at 4pm, but why me? I’d had bad sleeps for 3 nights in a row!) we got up, organised ourselves in the dark of the dormitory and caught a cab to the station, bought our tickets and waited and waited. Ginski went off to buy food for the train while I stayed with the luggage. Needless to say the beggars appeared, several approached me for money so I was glad when my son returned, train and bus stations are a little difficult to handle at times. We waited some more and the train on Platform 1 started making warming up noises. Ginski asked someone about the train that was there and it turned out to be the one for Budapest. Finally the information office opened and I found out that there was only the 10.30 train! The 5.30 train didn’t exist. So back to the hostel, we weren’t going to hang around the station for 5 hours. As an aside, some information for the rookie traveller in Serbia, or at least Belgrade….. While in Naples the first thing that the hotel pointed out to us was the places not to go because they were too dangerous, in Belgrade, when we asked the question, we were told that it is a safe city, the only thieves are the taxi drivers. So we had been clued up. The first drive from the hostel to the railway station cost us 400 dinars, when we needed a cab to take us back he loaded our luggage in the boot, then told us that the charge was 1200 dinars just for the luggage! Well we weren’t going to put up with that, then they started the game that cabbies often play where 3 or 4 of them will try to convince you that the quote is correct and when you still say no and go to walk away another one will pop up and offer to do it for half the price. I’m so familiar with that one from trips to Asia, there I had to argue with every taxi driver and if you weren’t on your toes you got done big time! My son is also a very experienced traveller, so these guys weren’t going to get the better of us! We ended up agreeing to 600 dinars even though I wasn’t happy but walking was not an option. Funnily enough our return trip to the station 5 hours later only cost 350! Yes you have to watch those cabbies pretty much all over the world. What I did learn was that if you got your accommodation to book the cab it was always cheaper because the drivers know that you will have been told how much it should cost. That piece of information was very useful during the rest of my solo travels. Finally we got on that train and we were on our way. A pretty uneventful trip although we were warned by other backpackers that it is very slow, and so it was. That train stops at almost every station between Belgrade and Zagreb as well as a lengthy stop at the border. There are several things you need to know in order to have a smooth exit from Serbia. Firstly, and possibly most importantly, your accommodation has to provide you with a slip of paper that proves that you are a legitimate tourist and stayed in proper accommodation, so make sure you get that and keep it safe, for without that bit of paper you could have problems at the border (although I have since spoken to people who have visited and stayed with family and they didn’t need the slip of paper and didn’t have any problems about that, go figure). The other is to keep your tickets and passport handy on the train. The first check of course, is your ticket when you get on, then there is the one on the Serbian side of the border when they check your ticket, take that precious piece of paper and stamp your passport with the exit stamp. On the other side of the border the Croatians check your ticket and stamp the passport with an entry stamp. That whole process is repeated on the Zagreb to Ljubljana leg. So all in all we had 6 ticket checks and 4 passport checks. We got to Zagreb and because for some reason we couldn’t get a ticket through to Ljubljana from Belgrade it was a mad dash off the train to go and buy tickets with only minutes till the train left. As it happened it was the same train that we had come in on, so I really don’t know why we were told that we couldn’t get a through ticket, perhaps a language barrier thing or a political inter country thing. It’s worth double checking that information, along with their timetables, because I don’t recommend doing that dash if you are travelling solo with luggage, we succeeded only because my son was with me and he did the dash while I watched the luggage. 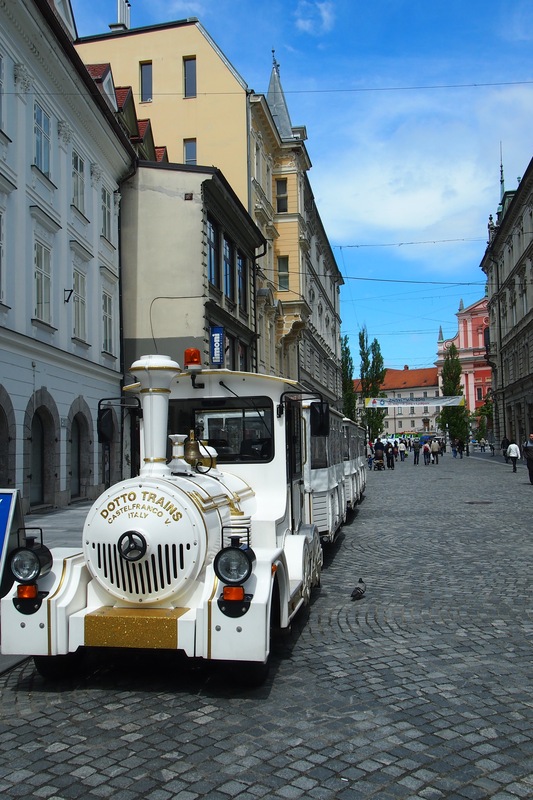 Or, plan to spend some time in Zagreb before moving on, we didn’t have that luxury of time. The rest of the journey was again smooth and easy with not so many stops, the longest was of course at the border but otherwise only a few along the way. 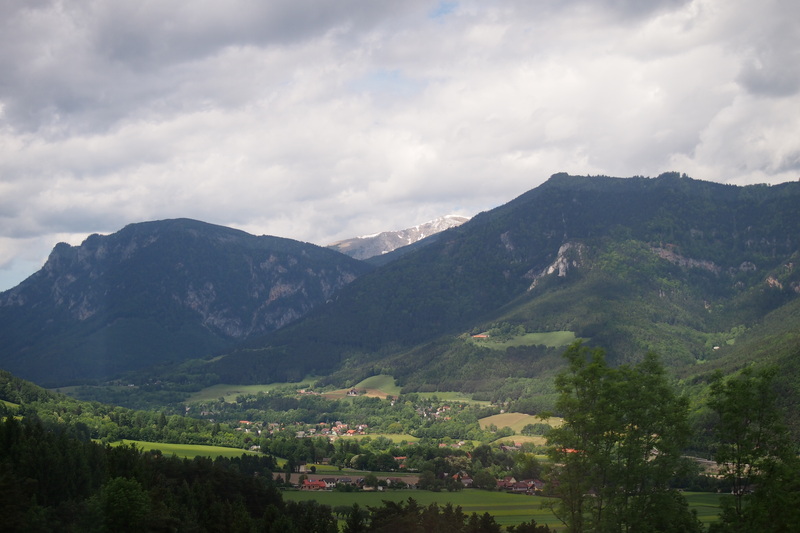 The scenery changed dramatically after the border to Slovenia. I had become accustomed to the flatness of Serbia and most of Croatia , Serbia in particular only gets mountainous as you get closer to the coast with only a few hills in the middle at Fruska Gora (and beautiful hills they are!). Slovenia on the other hand is pretty much mostly hills and mountains and you have to look for the flat bits. All three countries are very green and I’d even risk saying that they may challenge Ireland for the 40 shades of green title, but as I’ve only seen photos of Ireland and not been there yet I probably can’t compare, perhaps those who have been to both can comment. 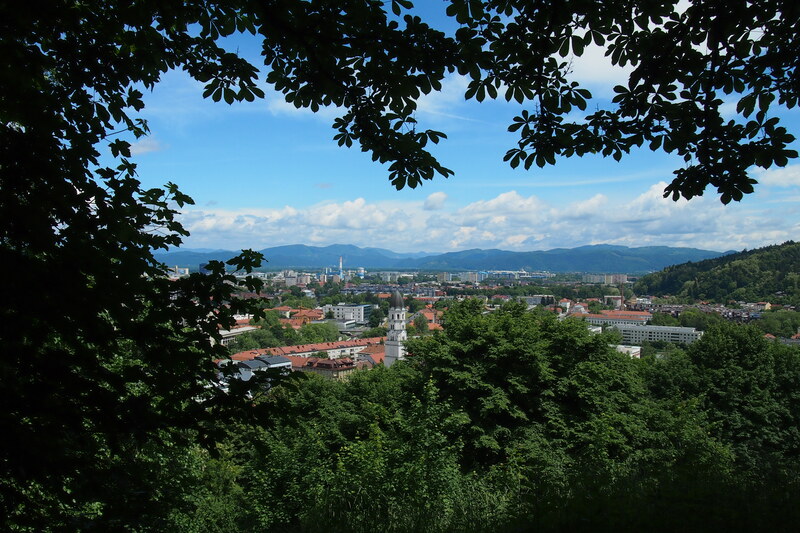 Very soon after the border into Slovenia the hills appeared, forested, green and beautiful. The train travels through the valley alongside the Sava River all the way to Ljubljana. I fell in love with the country there and then, just from what I saw out of the window. I was listening to my ipod most of the time and can highly recommend soft saxophone music to accompany the view, I happened to have had the foresight to download two albums, one called Sax and Candlelight and the other Sax and Romance both with Dennis Solee on the saxophone and they proved to be perfect for sitting on a train watching the Slovenian hills get taller and greener while the river just did it’s own thing rushing over rocks creating little rapids in places and in others just smoothly flowing by, minding it’s own business. I wish I could have heard the gurgle of the water in real life, but I have a good imagination so the gurgle was there in my mind behind the saxophone. 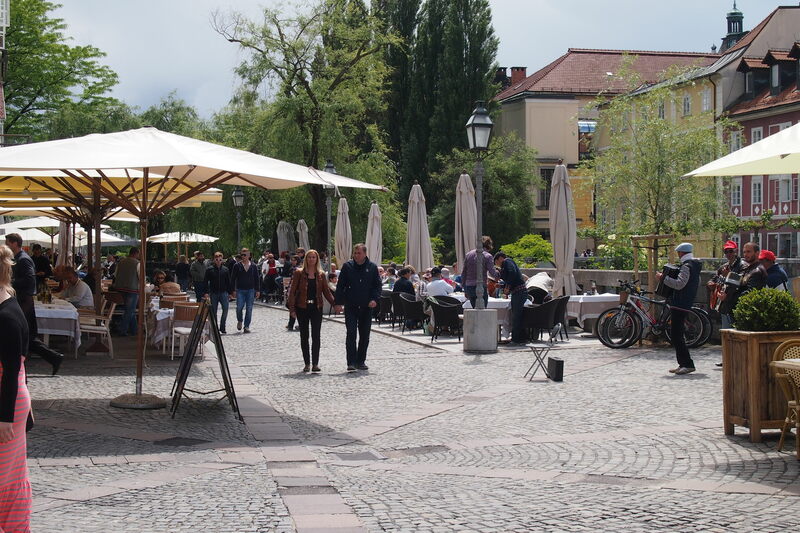 We arrived in Ljubljana at dusk– it’s light here for a lot longer than it is back home, and headed off to the hotel only a few blocks from the railway station. We checked in and headed to our room on the 8th floor. As soon as we opened the door the overpowering smell of stale cigarette smoke hit us, so we left our luggage and took off back to the desk to sort this out, I had, after all, booked a non-smoking room. Luckily the clerk was a nice guy and fixed it immediately by moving us to the 5th floor. When I entered that room I also realised that the one on the 8th floor didn’t even have the same bed configuration I had booked, whereas the one on the 5th floor did. No big problem, just one more thing that was fixed rather easily. I won’t mention the name of the hotel, it may have been a one-off mistake, however I wouldn’t stay there again. So here it was 10.00pm and we hadn’t really eaten properly all day, cold pitta and a couple of packets of crisps don’t count, so we went in search of real food. It seemed easy to get around the centre as it is one massive pedestrian area along both sides of the river with restaurants and bars all along the way. We did notice something peculiar and that was that we couldn’t see anyone eating dinner. They were all either drinking cocktails or eating ice cream. In fact most of the places along the way were actually ice creameries or bars. We finally found a restaurant with real food and sat down only to be told that the kitchen closed at 10pm. Hmmmm. The waiter did say he’d check, maybe the kitchen could rustle up a salad, but we wanted real food after a day of travelling. We asked if there was anywhere that would be open and he suggested ‘maybe the pizzeria around the corner’ oh no not pizza! Oh well, when hungry pizza will do. We found the place and discovered that not only do they stay open till midnight but they had local food as well as pizza. Not knowing anything about Slovenian food it was a bit of a lottery, but we ended up with very nice meals, tasty and satisfying. 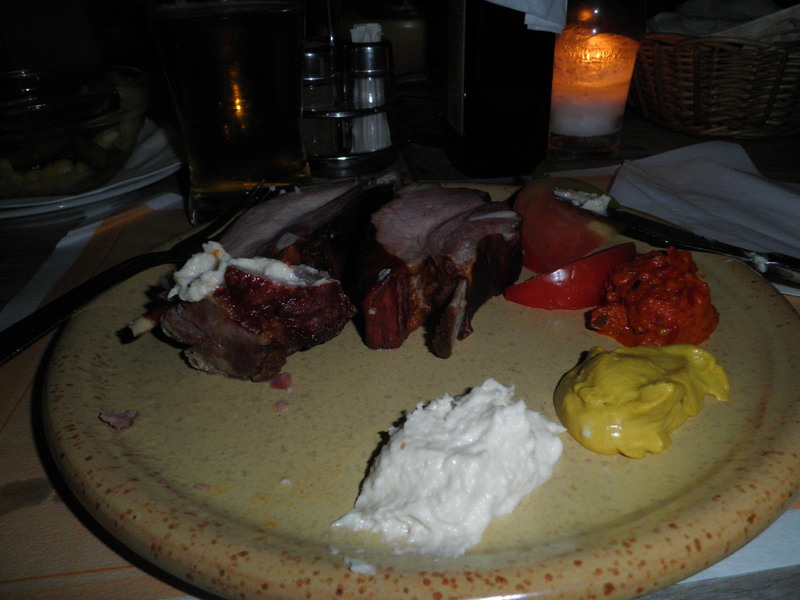 I liked the taste of Ginski’s meal better than mine, I had chosen a dish with smoked pork, although nice it wasn’t spectacular and I later found out that Slovenians have a ‘thing’ about smoked pork, it’s everywhere! 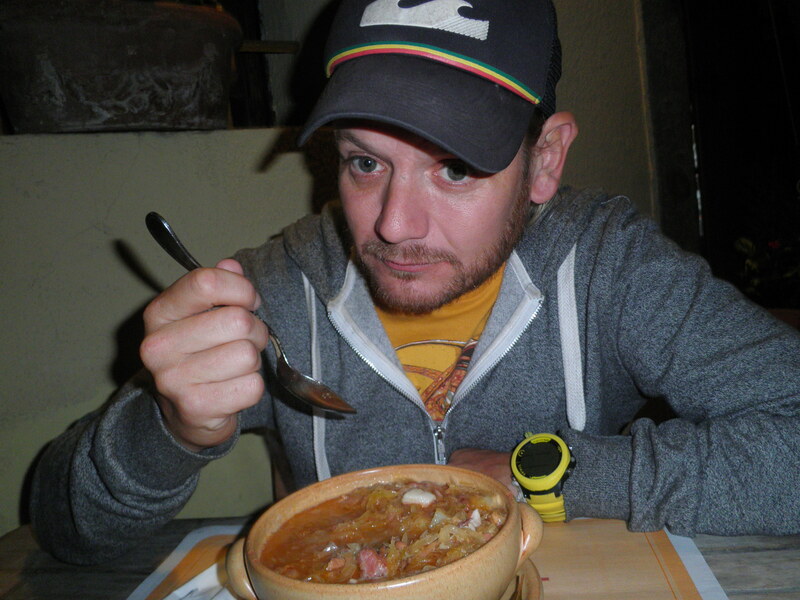 Finally, dinner had been foraged after 10pm in Ljubljana. We found a place to rent a car and picked it up at 10am – an Opel Corsa – lucky they found one with GPS. Ginski was a happy lad, loved the feel of the car and it had some speed as well. 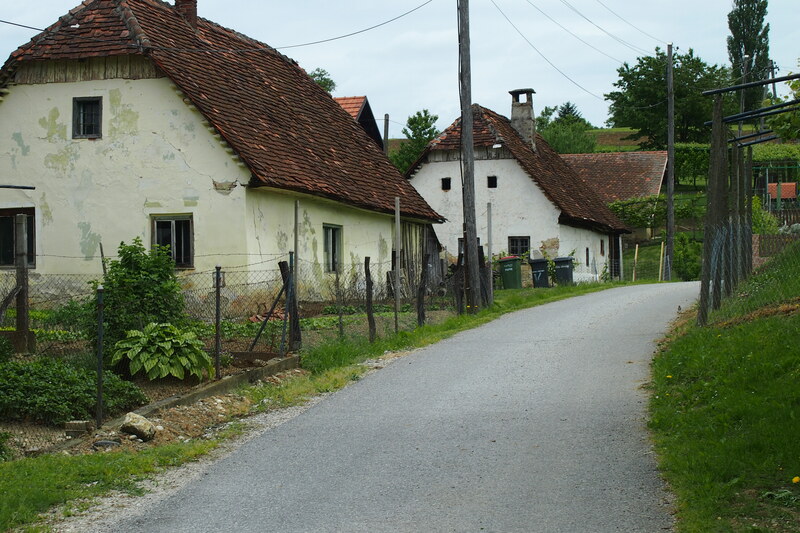 And so, GPS sorted we drove out to Hrastovec. We passed through the most beautiful vibrant green countryside and several tunnels, which are quite different in style to ours, and finally reached our destination. 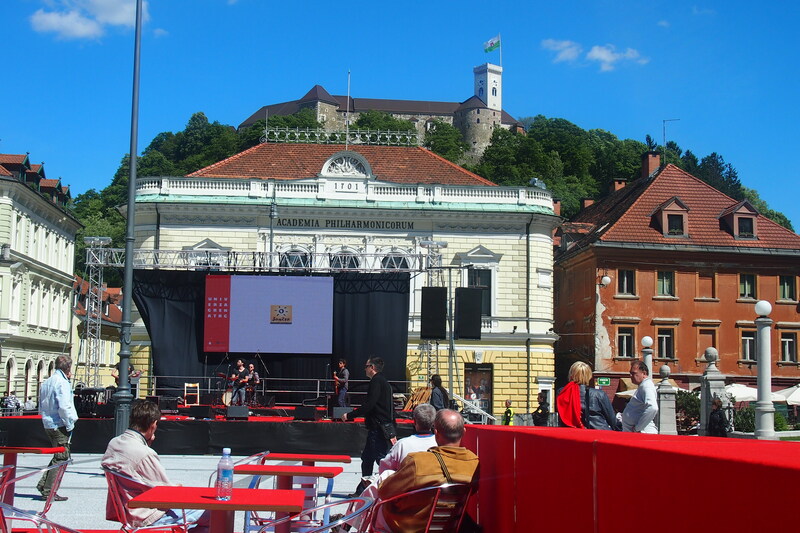 Our destination was part of our search for my mother’s schools, a Slovenian castle that was gifted or perhaps lent to the Russian émigré schools (by the Kingdom of Serbs, Croats and Slovenes) after the schools escaped from the Russian Revolution and Communist take-over. Having found her first monastery school in Fruska Gora in the Staro Hopovo Monastery and her Third school in Bela Crkva in Serbia (these are described in previous stories) we were on a mission to find Mum’s second school. She was too young to move on to the Marinski Donskoi Institut in Bela Crkva after her first 5 years in Staro Hopovo and so was enrolled in the School at Hrastovec in Slovenia. She only spent one year there but her amazing memory retained the information extremely clearly, just like everything else in her life. Such excitement, we found the castle, unfortunately it became a psychiatric institution at some point (and still is one) so we couldn’t even get out of the car let alone see the inside. 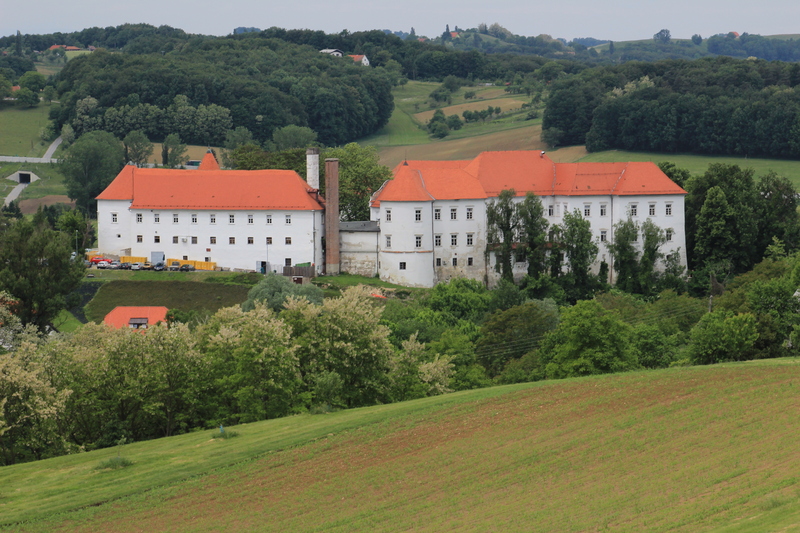 I’ve heard that Slovenia is planning to move all psychiatric institutions out of the castles where they have been for ages and into more appropriate accommodation, then turn the castles into tourist destinations. I do hope that this happens while I am still able to travel, I want to see the inside of that place as Mum had said that in her time there the ceilings were covered with cloth. 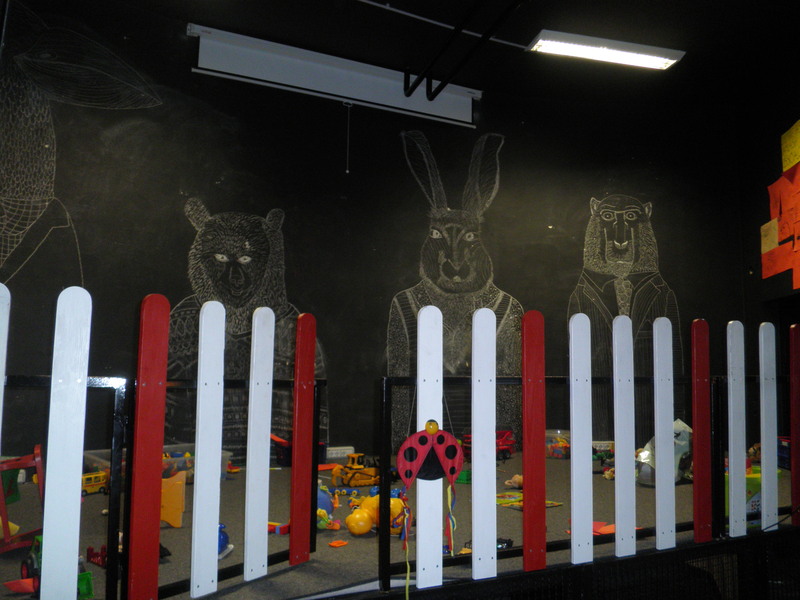 As an adult, after thinking about the possible reason for this, she suspected that perhaps the ceilings were covered in ‘inappropriate’ art for young eyes. As most castles and palaces in Europe have very ornate paintings on ceilings, often of nudes. I think she may have been right in her supposition. I would really like to see what is on those ceilings if they haven’t been ruined over the years. As we couldn’t see the inside Ginski drove around and we found places where we could take great photos of the outside (thank goodness for long range lenses, make sure you pack one in your luggage). After the initial photos we drove on and found another spot on a hill where son took photos of the castle while I concentrated on the village. I’m not sure if the village was for the workers or for ‘out patients’. They had little gardens and cute village cottages. We were rather closely watched by a lady sitting on a stool outside one of the cottages, probably her home. Then we found yet another spot on a hill, this time I concentrated on the surrounding forest and flowers and Ginski did more castle (after all he is the professional with the much better camera). 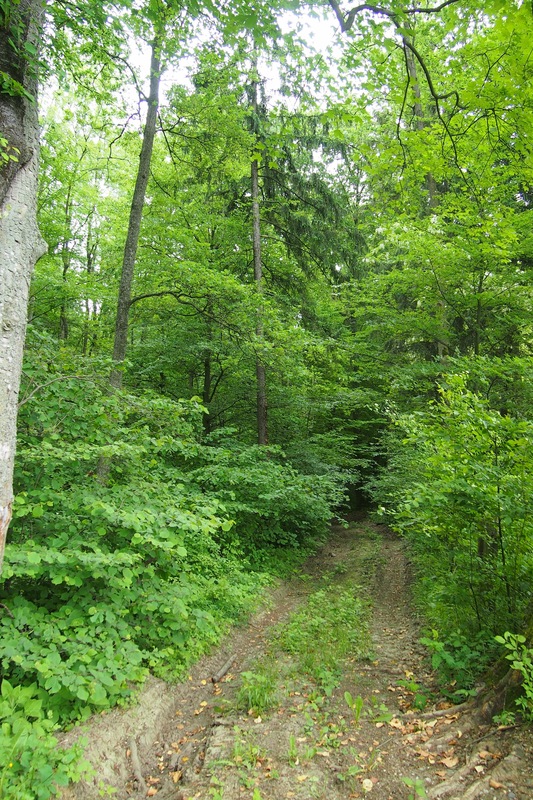 Some of the forest still close to the castle, I guess my Mum may have walked hereFor me it was great excitement having found this place, I just wish we could have seen inside. 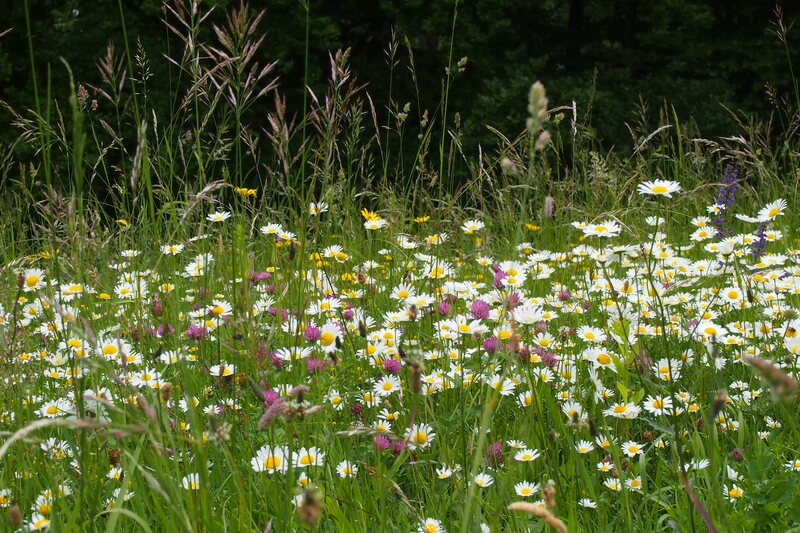 Beautiful Spring wild flowers, perhaps offspring of flowers seen my Mum’s childhood eyes. Eventually we had done all we could do there and so drove on to Lake Bled, reaching there at around 4.00pm. At that point it struck me how short distances are in Europe compared to Australia. We found our accommodation at the Vila Viktorijah, and we were on the 2nd floor! No lift, eek! 55 steps! Luckily Ginski was there to take my luggage up. The hosts were nice, young and friendly. 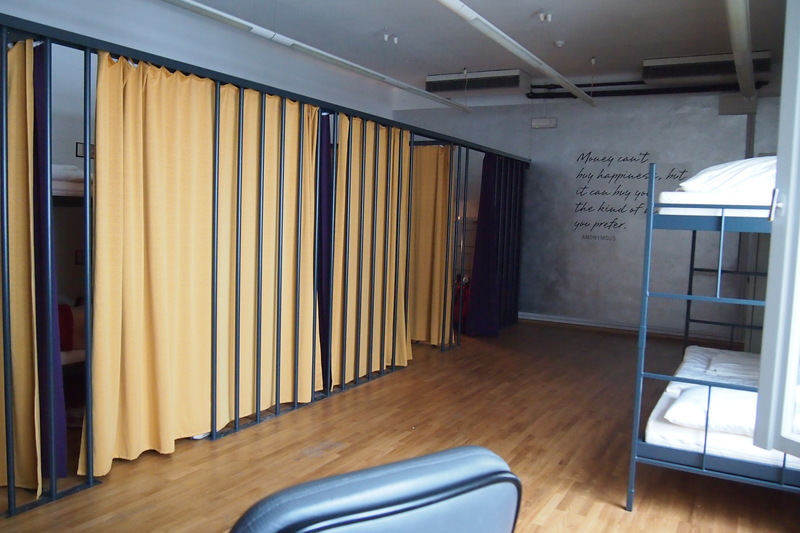 I didn’t realise that towels weren’t included in the price – 3euros a day! Breakfast was 2,50 euros but was actually worth it, a ‘health jar’ of muesli with yoghurt and banana plus a glass of raspberry drink, a strange combination as I’m pretty sure that drink was cordial. When we left they very nicely only charged a one day fee for the towels. Normally a traveller should always have their own towel when staying in hostels, but I’d run out of room in my luggage. I climbed those stairs at least 4 times on day 1. At least the same on day 2 and twice on day 3 so that’s 550 steps minimum in 3 days (if my maths is correct), not bad for an overweight old duck. 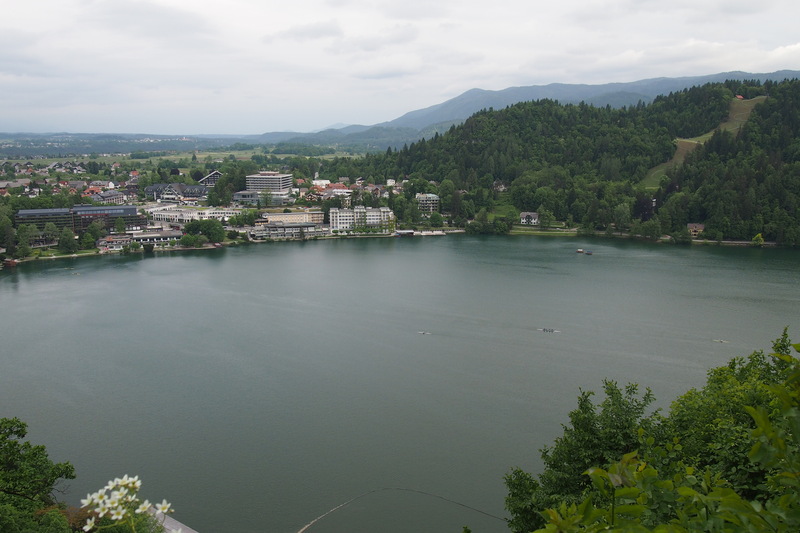 Bled is very hilly and I couldn’t see myself doing much walking, lucky we had the car. We drove around the lake to see if Ginski could run all the way around – there was a path so he could have. Initial impressions were a bit disappointing as it has become so commercialised for tourism and there are so many modern hotels on the foreshores. The architecture simply doesn’t fit with the landscape, I’m sure they could have designed better looking buildings to serve the growing tourist trade instead of the square or rectangular white and glass boxes. We stopped and had a look at the castle, on the banks overlooking the lake, very pretty with the water views and swans. However, it was 8 euros to get inside and apparently there is only a restaurant and wedding venue in there so gave it a miss. Slovenia is a rather expensive country so be prepared to spend money, but do not miss this country it is seriously gorgeous. 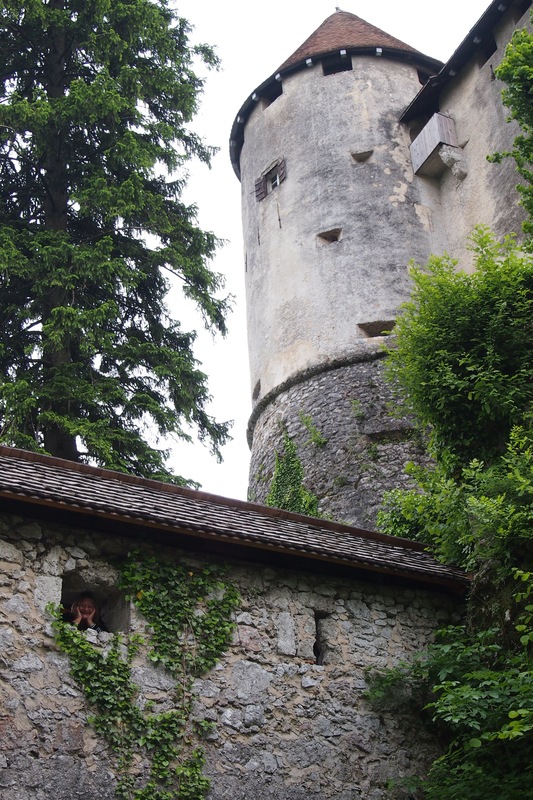 Lake Bled Castle. There I am in that tiny window! Our last full day in Bled. I woke up late but still made it to breakfast. 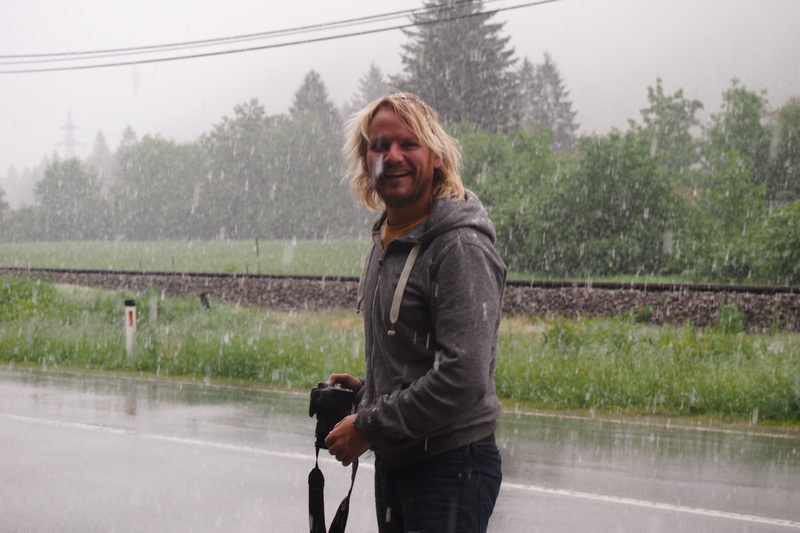 It was a drizzly morning but we decided to drive to Bohinj lake anyway, there was nothing much to do in Bled on a rainy day and neither of us is great at sitting around all day. Lake Bohinj is 3 times larger than Bled and ¾ of it is in the national park so I figured that it would also be less commercialised and built out. So off we went, we decided warm clothes weren’t necessary (not that either of us had much in the way of warm clothes anyway) and that as I had my camera Ginski didn’t take his, we regretted those decisions. Half way there son said ‘ that rain is hitting the windscreen like snow’ I looked and replied ‘probably because…..yes! 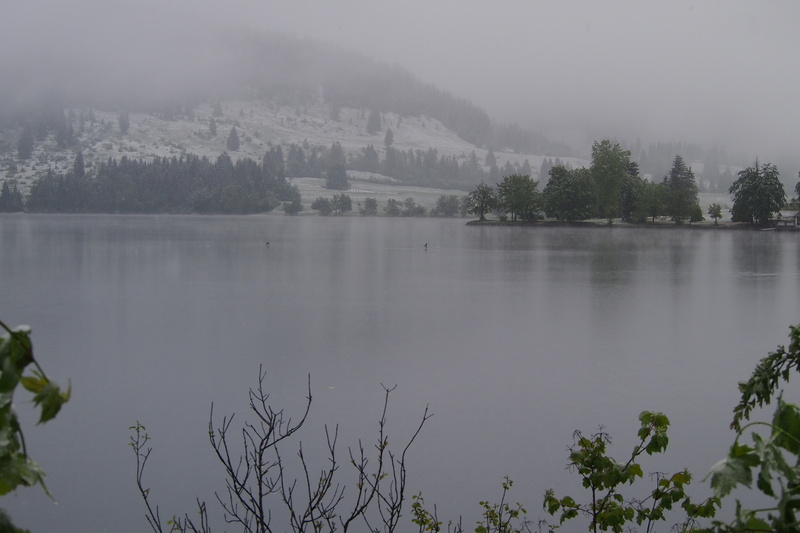 It IS snow!’ This we couldn’t believe, it was the 24th of May for goodness sake! So a decision was made to drive back to the Vila to get Ginski’s camera and whatever we had in warmer clothes. 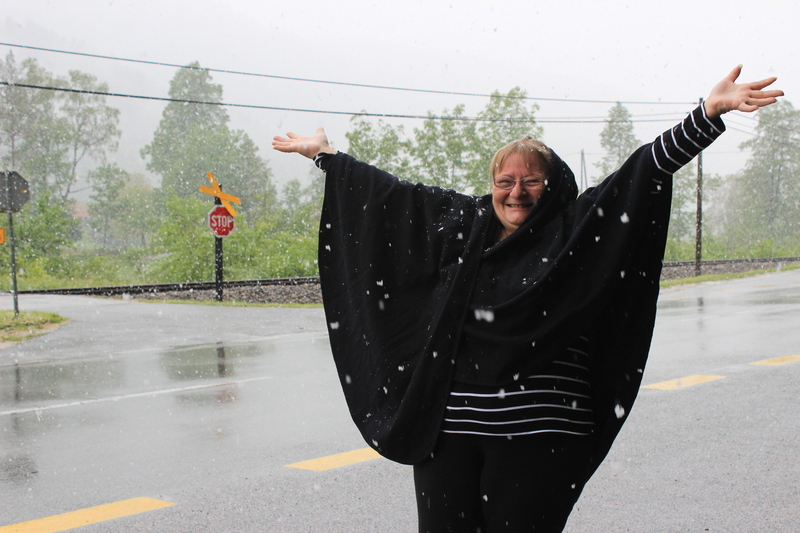 I was so glad we did that because we had a ball taking heaps of snow photos, I don’t know how much snow fell that day but there was enough to make the 24th of May 2013 memorable!! On the way we noticed a group of people just coming off the lake with their canoes, now that’s commitment to your sport. 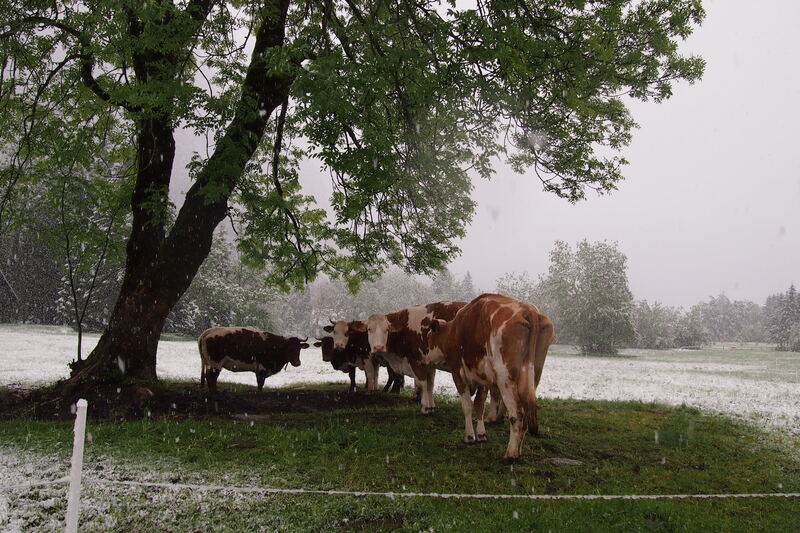 The cows on local properties didn’t appear to be very impressed with the weather at all. All other living beings must have found shelter as there wasn’t anything else that was living and breathing to be seen. We could sort of see Lake Bohinj. 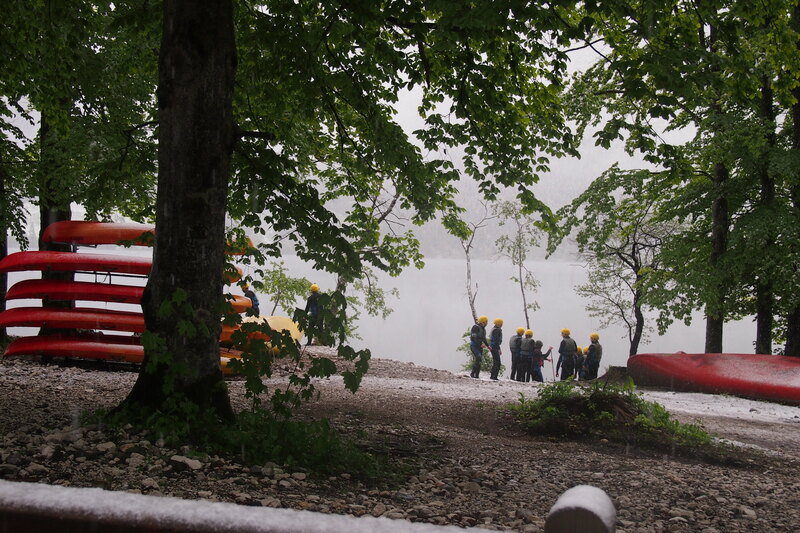 These crazy guys had been out canoeing in the snow. The evening was spent back in Bled at the Kult Klub with Fiona, Sally and Skye, a lovely group of ladies, friends of my son who just happened to be in the same place at the same time. It was such a fun evening and a bit too much wine went down, not too mention the first shot of local Slivovic type stuff to warm us, as previously mentioned, we didn’t have warm clothes with us and it was freezing! 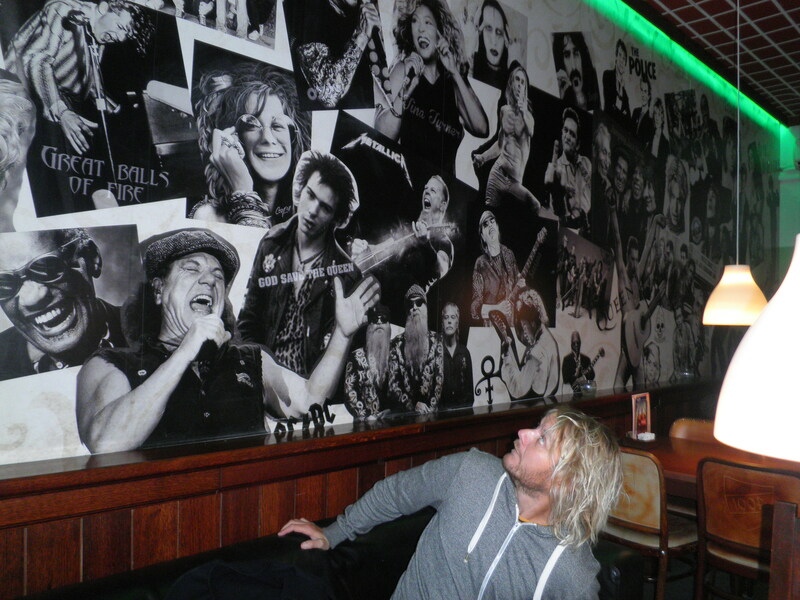 Games of thumb wars, dinner of pizza all overseen by a wall of famous performers. The Kult Klub is an interesting place, although it is quite obviously a club for drinking there is also an area set aside for children, with toys and giant pictures of story characters on the wall. The only thing I could relate this to was our Australian beer gardens where children are allowed, this one though was indoors in the same bar area. Perhaps this is because of the much colder weather. Up in the morning and packing, time to leave Bled and head back to Ljublana so Ginski could fly out to London on his way back to Utila where a friend had started an underwater filming project and wanted him back with his skills. So out to the airport with the car to return it, had a meal there and sat around waiting for a few hours for Ginski’s flight, poor man was so very tired, way too much partying the night before. 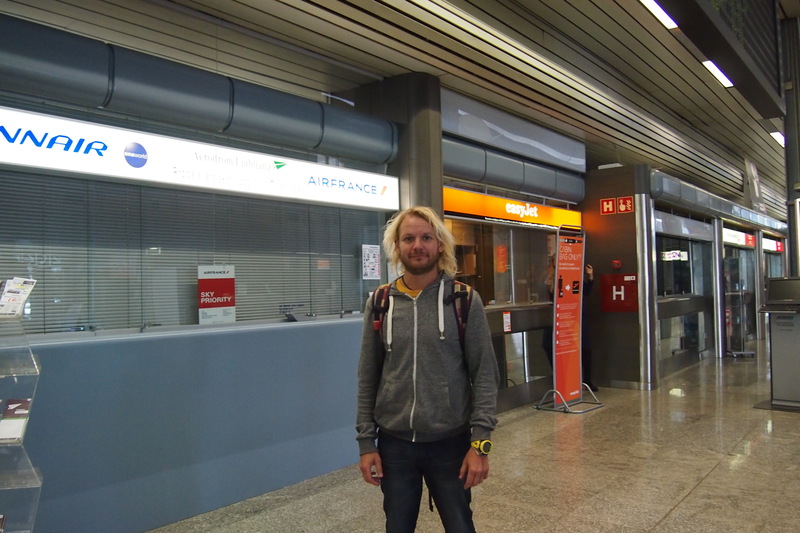 Farewell son from Ljubljana airport. I then got the shuttle back to Ljubljana, it cost 9 euros but he did take me straight to the hostel I had booked for myself, or as close as possible as it’s all pedestrian area. The Tresor Hostel was an interesting place. An old bank building that was transfoemed into a hostel. In the process they wanted to maintain the concept of the bank so my room (although a 10 bunk dormitory) was broken up into cells of one double bunk in each cell. Every door to a dormitory also had a symbol of a world currency on it. Fascinating. Very difficult to describe in words. Tresor Hostel Ljubljana in an old bank building. My dormitory. And now I was on my own for the first time on this trip. Phase 2 of my trip began, alignment of Body, Mind and Spirit through solo travel. Spending almost 3 years in the doldrums had taken its toll. The first year of that period was total stress from the abusive treatment at work and the passing of my beloved mother, then 2 years of legal stress. I was a mess on the inside. I had put on weight, ruined my back and was totally unfit, not to mention very unhappy and very lost, so it was time to get over it and get on with it, I’m not really the type to stay stuck for too long. One good thing that came out of the previous few years was stumbling across the principle of the Law of Attraction as well as the Abraham books. I liked the concept, it suited my belief systems and I had started working with those principles even before I’d left home. Now it was time for me to follow the advice on re-alignment more closely. So I decided that for the rest of my trip I would spend the last minutes of every evening and the first minutes of every morning doing the suggested thinking exercises. Decision made I decided to go for a walk, I thought the markets would be open but Ljubljana is old fashioned so only eating places are open on a Sunday, no markets and no other shops, what a shame, I was rather looking forward to some sumptuous strawberries. I read the legend about Jason and the Dragon at reception and then went to see the Dragon bridge with its sculptures. I realised the next day that what I thought was the Dragon Bridge was in fact, the Butchers Bridge. I had mis-read the map. This explained the pretty gruesome sculptures that I found there. 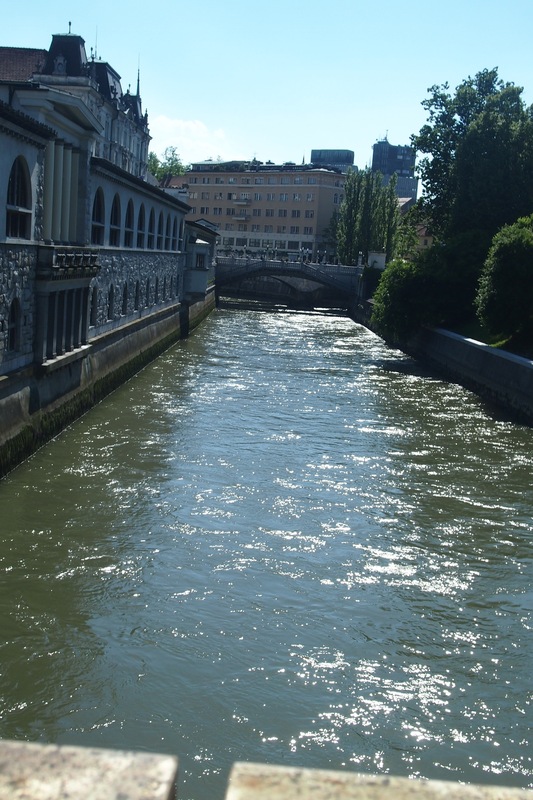 The bridges in Ljubljan are generally named after the trades that were clustered in that particular area. 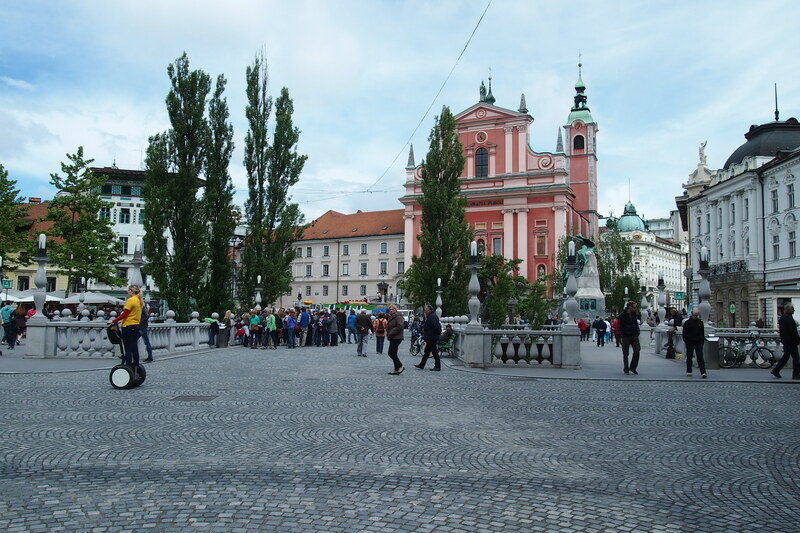 I found that walking around Ljubljana is really easy, the old town is reasonably small, on both sides of the river. There are lots of musicians around busking and they are all good. A band near the market area, a small band near a bridge by the river and a saxophonist near the tourist train, he was really good. 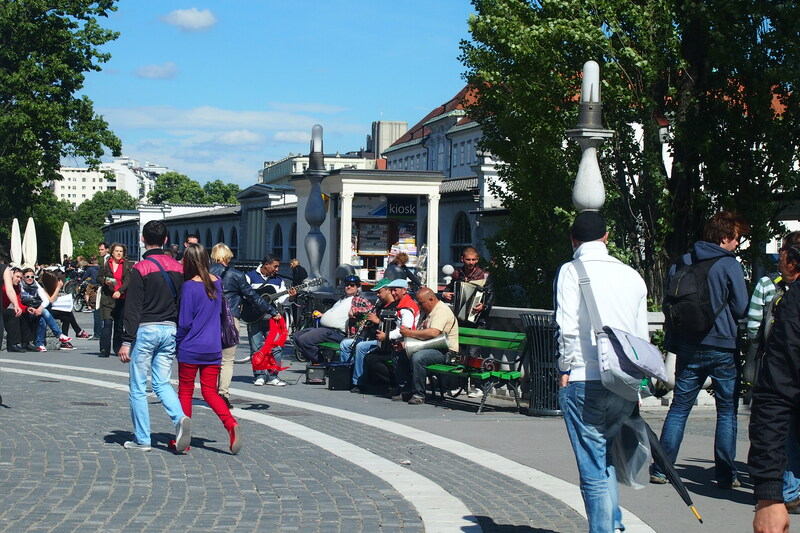 Such a cool place for a romantic walk accompanied by busking musicians. 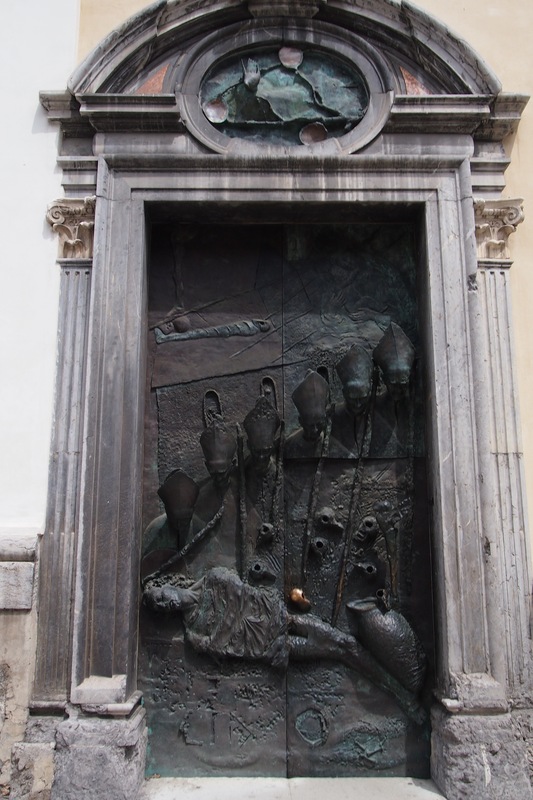 I stumbled across the Russian Cultural Centre which I visited the next day and yet another Church of St Nicholas, only because I noticed it’s amazing heavy brass or bronze door with carvings of bishops heads and a beautiful handle. I caught the cute little tourist train to go up to the castle and spent some time up there wandering around, sadly I discovered that my height ‘thing’ hadn’t been cleared up regarding climbing up stairs to high places, or any other heights. What a waste of money that hypnotherapist back home was. Darn it! I still have that challenge and really want to fix it. One day I’ll find exactly the right help. 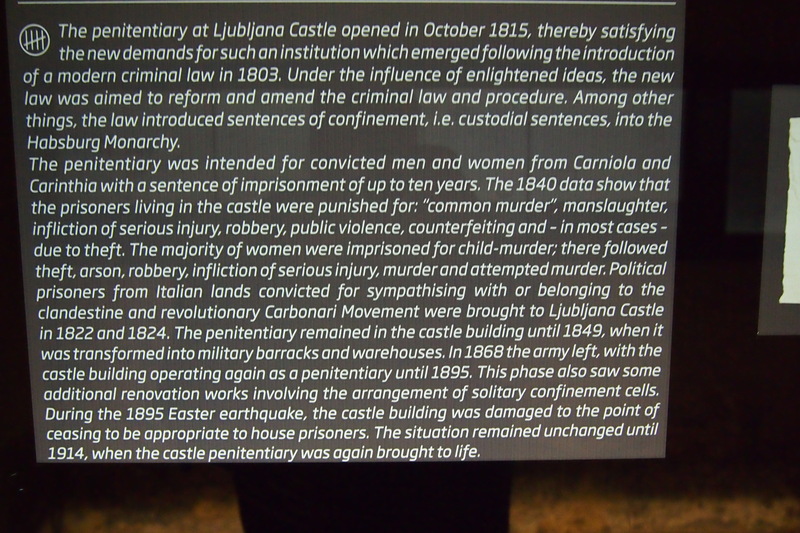 The castle itself was interesting, the cells where they locked people up must have caused great angst to the prisoners. I have added a photo with the explanation so I hope you can read it, there is far too much information for me to write it up within the blog. The gardens around the castle are very meditative and pretty with a lovely view of the city below. I caught the little tourist train back for lunch at around 2 o’clock . By the time I went out again it had rained and turned cold! But I still went for another walk in a different direction and eventually ended up at the river again. This time I decided to test the ice cream, very nice indeed. And so ended my first day on my own. I had been trying to figure out which country or city to go to next but nothing was making itself clear to me. Finally I decided to go to Austria by train. It turned out that I couldn’t book a train ticket online, something about the website needing more than 3 days notice so that was an issue to solve the next day. So much to do that day! Firstly I didn’t want to go out until I had done my washing and had booked both the train to Vienna and accommodation. Booking the train online was all too confusing and seemingly impossible due to the time frame, so I asked the lady at reception, she had troubles too. That meant that I didn’t want to book accommodation until the train was sorted, so instead off I went to talk to the people at the Russian Cultural Centre ,that I’d stumbled across the day before, about much more interesting subjects. 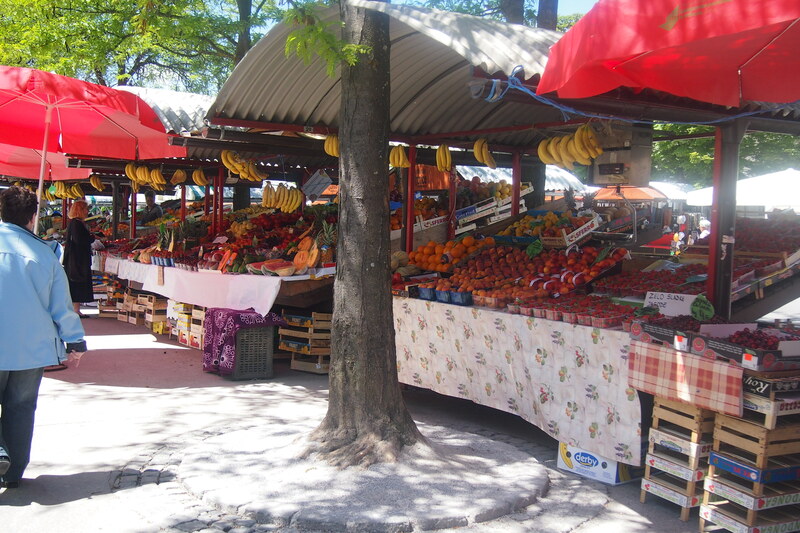 I walked via the markets. Yum! Those beautiful strawberries and cherries! I had a wonderful long chat with the people at the centre, including the director. The ladies didn’t know much but the director was quite knowledgeable about the school in Hrastovec and the welcoming of Russian refugees before and during the revolution and war. It seems that the communist era in Russia managed to obliterate all memory of the Russia they took over. I went away having shared some information with them and they gave me the website for the Russian House in Moscow which collects lots of information on the earlier period and I promised to send them the info that I had received from Dejan in Maribor University, which I did. I also sent photos to Bela Crkva as promised. So then I went wandering off to see Parliament and to find the Orthodox church, I was hoping it might be Russian but it was Serbian, the beautiful church of Sts Ciril and Methodius, unfortunately it was locked, so I couldn’t look inside. Along the way I saw the American Embassy, another lovely old building. Ljubljana is full of beautiful old architecture. I sauntered back into town and stopped at McCafe (yes, McDonalds really is everywhere) for a coffee. Well, it had to be done, couldn’t visit a city without having a coffee to test and photograph, my fans who were following my stories and photos would have been most disappointed with me. Actually, most friends would have probably preferred no coffee photos. I had the 2.20 euro deal of coffee and cake, not bad but not spectacular. After a bit of a rest, off I went walking again this time on the other side of the river. Ended up back at the Republik Square where the day before they were setting up barriers and a stage. Turned out that it was the University student bands performing all day in front of both the university building and the philharmonicorum building. I just caught the end of one band that sounded pretty good, unfortunately the next one was doing way too much screaming for my liking. But it was rather cool watching these guys right in front of the Uni buildings with the castle on the hill overlooking it all. 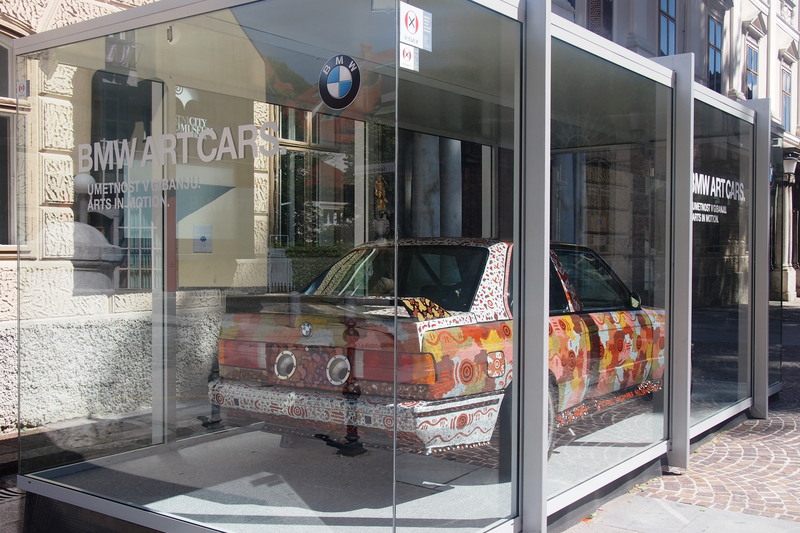 I continued on and found the BMW art car, in front of another museum. Had I known I could have seen their display of 5200 years of the wheel – however, that day it was closed! Drat! Not to worry you can’t do it all. That whole area seems to house parts of the University, I noticed that the architectural faculty building was in the same vicinity. BMW art car advertising the 5200 years of the wheel exhibition. At the end of the street I turned for home, almost back at the hostel I stopped to look at some postcards and realized that the bridge that I thought was the Dragon Bridge – wasn’t! It was the Butcher’s Bridge! So off I went to find the Dragon Bridge which was further on. On the way I found a sports store and bought one of those lamps to wear on my head like Ginski had (that was the best piece of advice my son had ever given me), makes life a lot easier in the dorms. I successfully found the Dragon Bridge and it was certainly worthy of lots more photos, then headed home. 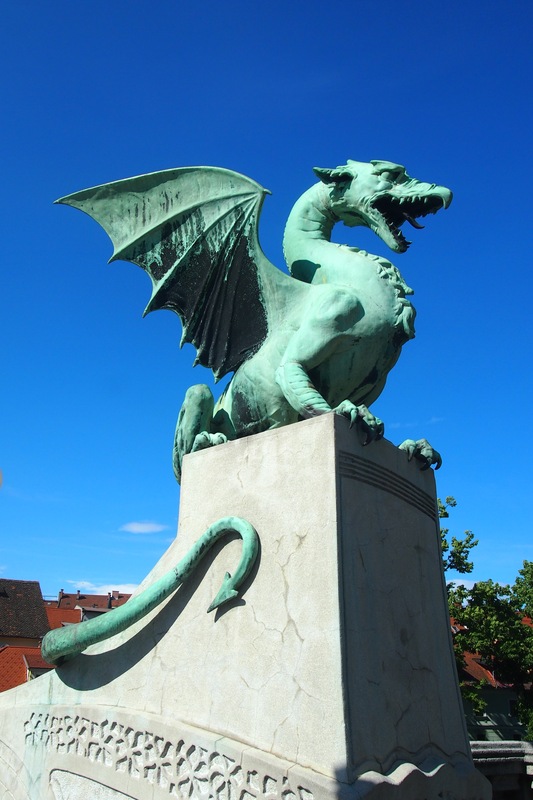 The beautiful statues of dragons on that bridge are incredible, such great artistic work. I was so thankful for the chance reading of a postcard. Back at the hostel I asked the guy on duty if he knew anything more about the trains and when he looked it up there was heaps of information. For example, there were some special tickets for 29 euros and I could also get a discount being retired. But that meant hoofing it up to the railway station! Man I was already suffering from all the walking, but it had to be done so off I went. And yes there were specials but the 29 euro one was for the 4pm train, I wasn’t keen as that would mean getting to Vienna at 10pm, so I opted for the 2nd special 47 euros for the 8am train, even better than the discounted seniors ticket at 54 euros and certainly better than the full price of 72 euros. On the way back to the hostel, I decided to buy a Doner kebab. First mouthful and I was coughing and spluttering! Thank goodness I’d said ‘only a little chilli’ it would have been inedible if I’d just said yes to the chilli question. And so, the train was booked, Wombat hostel – The Lounge in Vienna was booked, I was pretty much packed and the next day it was farewell to Ljubljana. As always I hadn’t managed to see everything but then, as I keep saying, you can’t do it all, the main reason for coming to Slovenia (finding my mother’s school) had been achieved and it was time to move on. I had decided I wanted to get to Vienna then Dresden and (hopefully) Oppach in Germany before heading up to Poland. And so another country, city and week on the Great Trek came to a close. I was so glad that I had visited this beautiful country. I was also very grateful that Ginski was with me, it meant so much to have him there sharing the experience with me and hopefully he has some awesome memories of visiting his grandmother’s history. Next chapter ….Vienna, see you there.